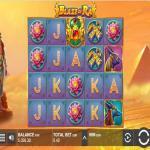 Blaze of Ra by Push Gaming is a 3D video slot machine that you can enjoy here for free. The online slot has five reels and 40 stake lines that you can place wagers on during the gameplay. You will enjoy plenty of features and claim multiple winning chances as you spin the reels. 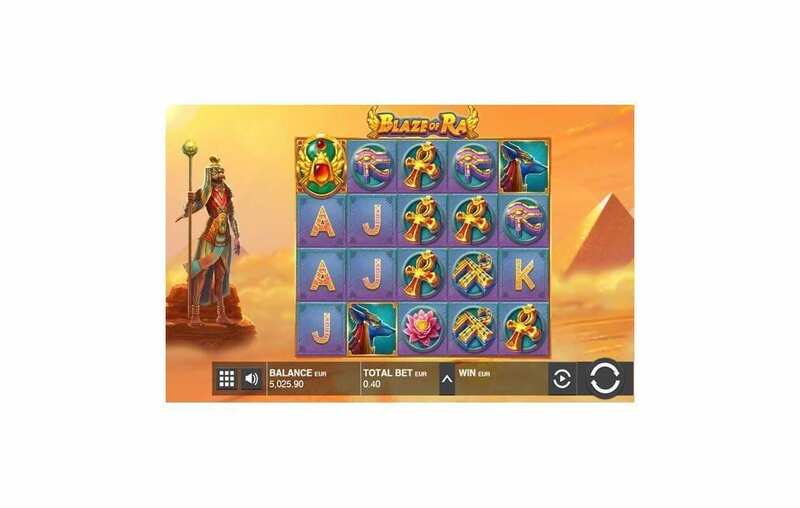 The slot machine has 3D animations as well, as you will see the God Ra, on the left side of the reels that will interfere with the gameplay to help increase your winning chances. Blaze of Ra has a wild icon, nudging wilds, and a free games bonus feature. 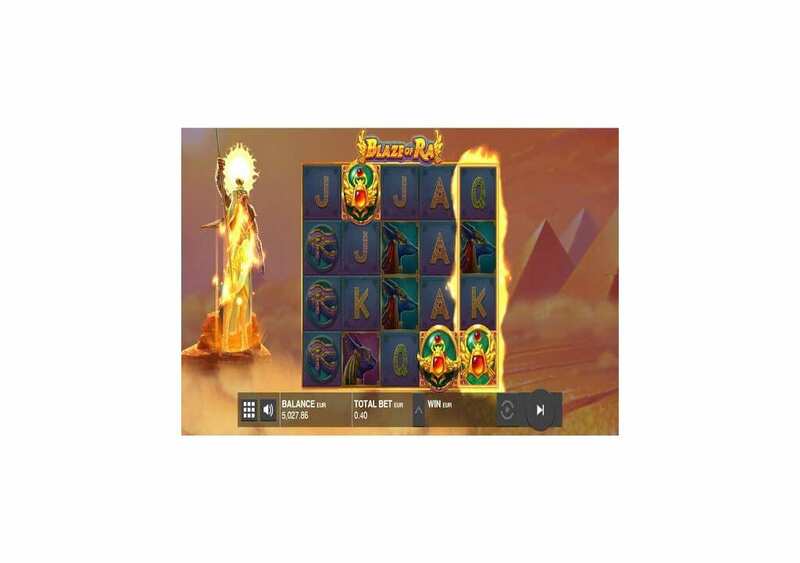 Blaze of Ra by Push Gaming comes with a 5-reel format that has 40 stake lines that are full of winning chances and bonuses. The online slot machine is playable here with demo credits so you can check it out and see all that it has to offer. 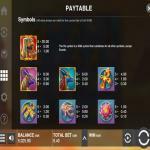 The online slot is accessible through mobiles, tablets, and computers, and it is compatible with almost every operating system out there. Blaze of Ra has 3D visuals and animations and comes packing multiple features. 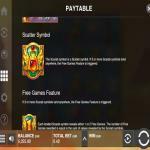 These features include the wild icon, the scatter, the nudging wild and the free games bonus round. Blaze of Ra by Push Gaming paves the desert road to Ancient Egypt excellently. The developer has come up with original gaming experience, despite having a theme that is the center of many slot machines. Visually, the slot machine will mesmerize you with its 3D symbols, animations, and interactive slot surroundings. The soundtrack also helps in immersing you into the theme with its haunting feel, and its features are impressive. It has the nudging wilds features with presents you with solid winning chances, in addition to its high-paying wild, and its free games. Although the number of free spins isn’t that large, the stacked wilds will help make up for that. So all in all, the slot machine offers a volatile ancient adventure that has all of the key aspects to make it an enjoyable experience. It combines high spec visuals designs, gameplay options, and features. 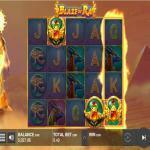 All of this makes Blaze of Ra one of the top offerings by Push Gaming. 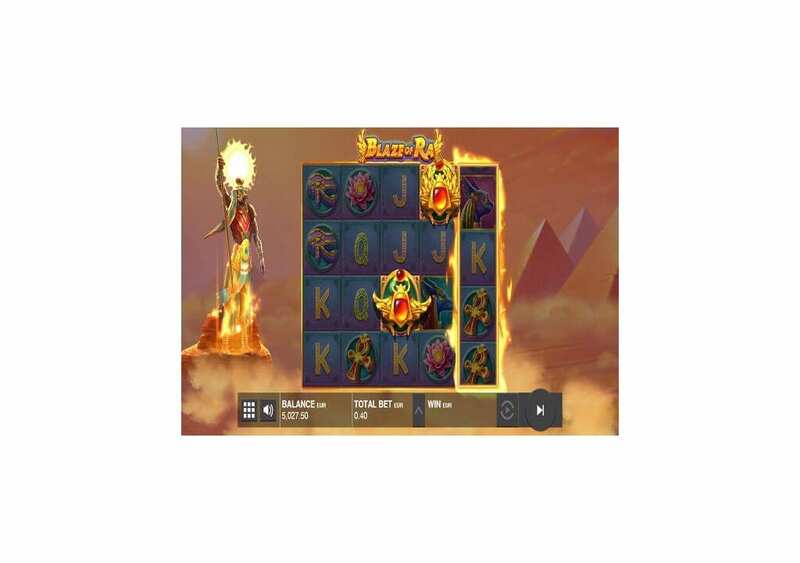 Blaze of Ra has a format that hosts five reels, four symbol rows and a total of forty stake lines. Since the slot has an ancient Egyptian theme, you will see the Ancient pyramids in the background on the right side. You will also see the God of the Sun, Ra, with his golden scepter in a 3D animated character on the left side of the reels. As for the symbols that will appear, they include Ra, the Golden Scarab, the Wolf God, the Eye of Horus, the Ankh of resurrection, an ancient Egyptian flower and card symbols. 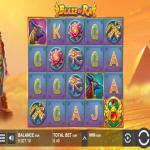 Blaze of Ra has five reels and 40 stake lines, and like many slot machines, it has the Left-to-Right payout format. 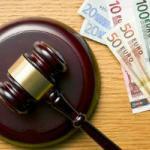 Therefore, you will have to get three matching symbols at least from the leftmost reel to the right to claim a prize. The prize will depend on the stake and the icon that you managed to match. The highest paying icon is the wild symbol, Ra the God of the Sun. The emblem will trigger a line prize of 5000 coins if you get five of it on the same bet line on the five reels of the slot. 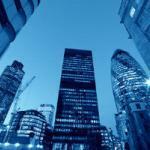 Blaze of Ra has an above average Return to Payer percentage which is equal to 96.40%. You will be able to see all of the payouts and the features of the slot at the pay table by clicking on the mini squares button on the bottom left of the control panel. 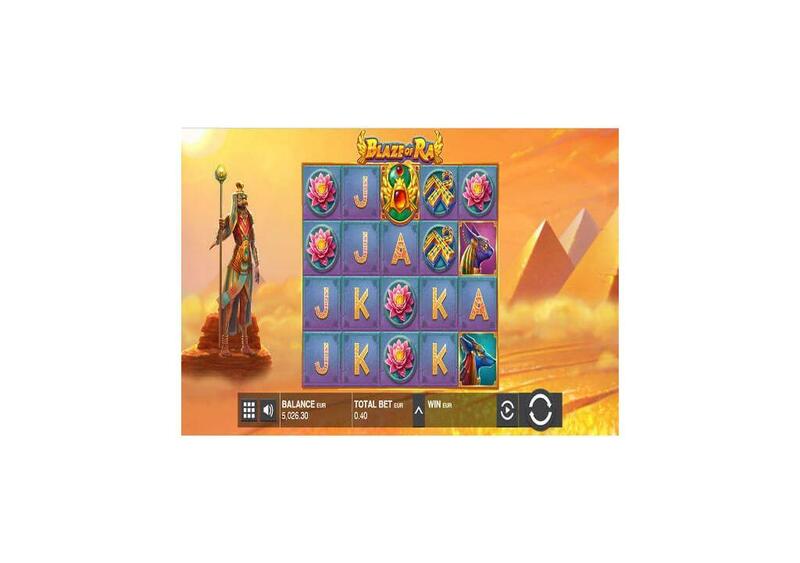 Blaze of Ra is a Push Gaming online slot machine, so you can expect to find plenty of features that you can trigger that will help you earn massive awards. 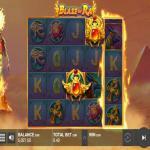 Blaze of Ra has a wild symbol, the nudging wild feature, and a scatter icon and free games. 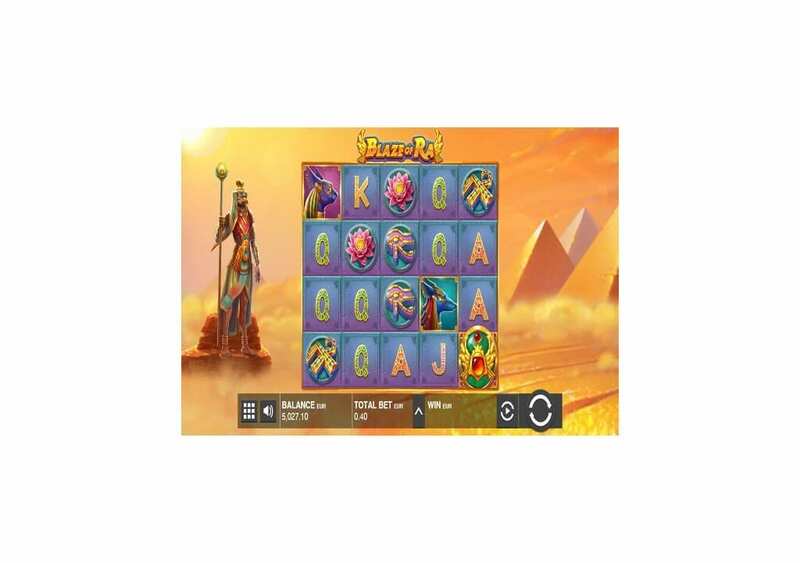 Since the online slot is all about ancient Egypt, and the God of the Sun Ra, it only makes sense that the wild icon of the slot machine would come in the form of Ra. The god of the sun is going to use his godly powers to substitute for the rest of the icons appearing on the reels. 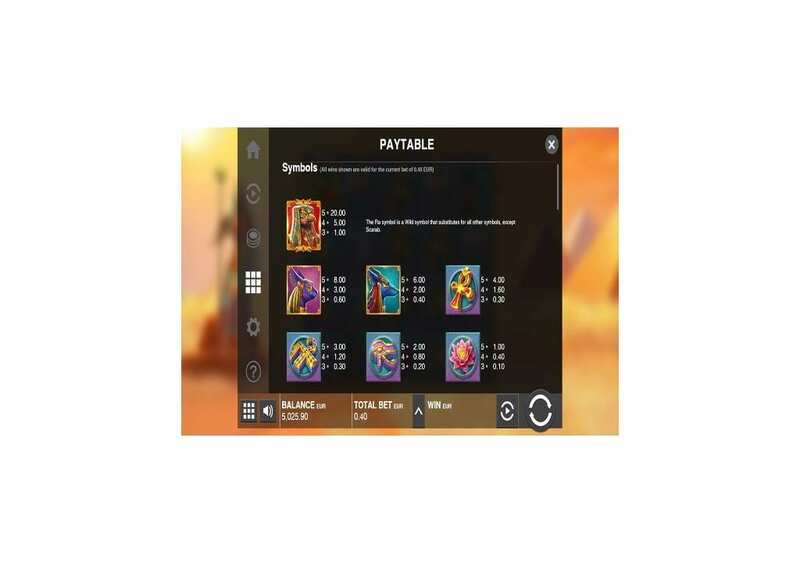 The only symbol that the god of Sun can’t replace is the other unique icon of the slot, which is the Scatter Scarab. Ra can also trigger the highest line payout when you match him on the reels. You can earn up to 5000 coins when that happens. Whenever you get the Ra wild icons on the top two positions on any of the reels before the round begins, you will trigger that feature. As the other reels spin, the wilds will nudge down one spot for each turn until they drop off the bottom. 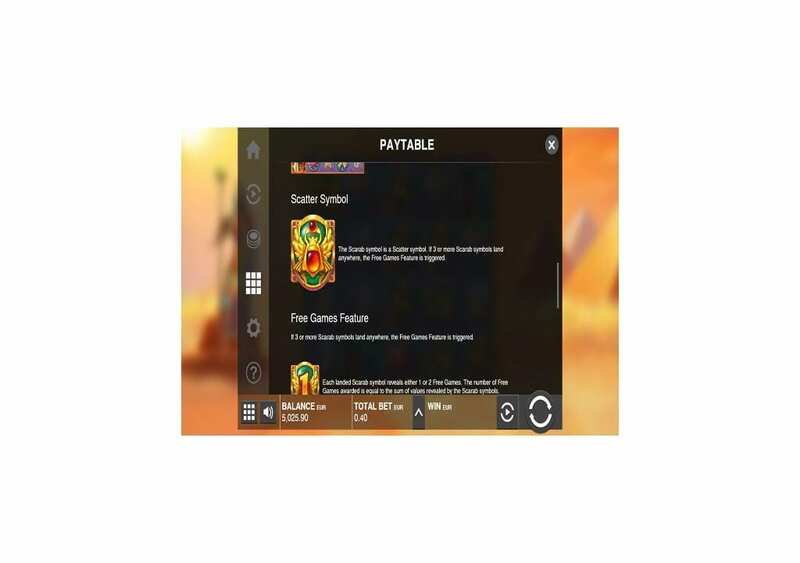 The scatter icon is the Scarab, which is the symbol that is responsible for activating the free games feature of the online slot. You will need to get three of these symbols anywhere on the reels to achieve that. The free games feature will award you 1 to 2 free games for each scarab that you get on the reels. During the free games, reels one, three and five will contain stacked wilds and will remain there during the free spins. Last but not least, every Scatter Scarab that you get will add an extra free spin to the total you got.